What are some different ways people have measured time? See how to read a sundial and find out about other clocks. How many days are there until the first day of the new year? This New Year Countdown is based on the time in the UK. If you live in a different part of the world, click on "Time Zone Map" under the Countdown screen then click on a city (red dot) where you live or that's close to you. What does a cuckoo clock sound like? How long does it take to snap your fingers ten times? Use an online stopwatch to time yourself. Where is it day and night right now? How old would you be if you lived on planet Mercury? Click on "Time" in the left menu then in the "Click a chart below" column, click on "Time, time devices". Can you set the correct time on a mechanical clock and a digital clock? Click on "Practice" then "Go" and find out how to set the time on the different clocks. Click on "Go" to try the first level. Can you match the time on different clocks? Play a matching game to find out. How does a musical clock work? Scroll down and click on the play button to watch a video of how an 18th century clock works. This book answers all kinds of questions about time, from ‘When did time begin?’ to ‘How does a sundial work?’. 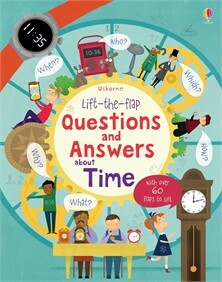 Children can lift over 60 flaps to discover what, where, when, how, yes or no, and learn about the time on a clock, the months of the year and time zones around the world. Published in association with Royal Observatory Greenwich.